This week I wanted to incorporate the romantic theme of Valentine’s day, but having already done a blind date, I wanted to stay away from the dating scene. 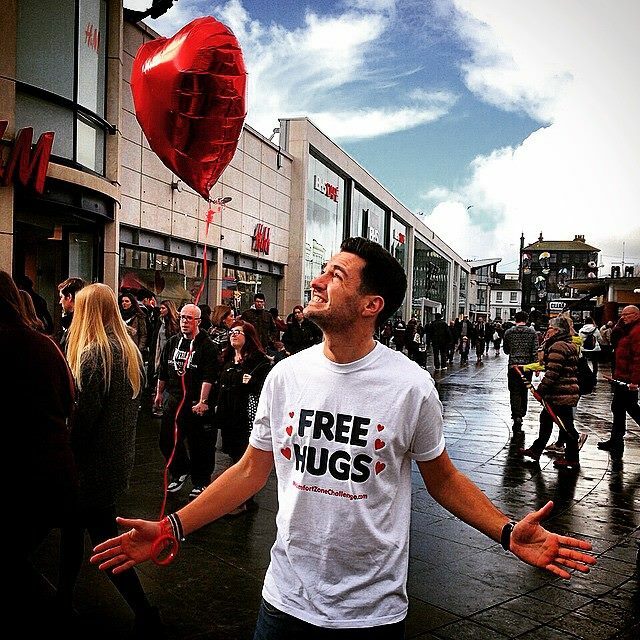 Inspired by Juan Mann’s Free Hug Movement, I wanted to create a Free Hug Movement of my own around Brighton. The idea is that you give a hug to strangers, as a random act of kindness to make somebody’s day better. Rather than a sign, saying Free Hugs, I created a cheap t-shirt online. The t-shirt was terrible fitting, it came out like a tent on me. Not the best start. Then to complete the look, I was convinced to buy a helium love heart balloon. Luckily, it didn’t rain, as I didn’t for a second consider a plan B for if it did rain. I wasn’t particularly nervous before this task, maybe I just under estimated it, but I went in with a ‘what’s the worst that can happen’ type attitude. It was only once I had taken off my hoodie, shouted ‘FREE HUGS’ and received ZERO hugs, that I began to regret doing it and felt like a weirdo. I have to say this is probably the weirdest thing I’ve ever done. There was a huge sense of relief when I received that first hug, I think I may have even thanked them. What was amazing, once I had received the first hug, like a domino effect, people just kept coming. The key to the whole task was finding areas of high footfall. In areas of low footfall, the recipient found themselves in an awkward social situation and people were hesitant to do it. Funny how people follow the lead of others, right? There were a few funny reactions to my cries of FREE HUGS. A couple of people thought I was shouting FREE DRUGS and replied “yes please”. One gentlemen, gratefully received my free hug, but told me his hugs weren’t free and that I owed him £2. He let me off eventually. One women asked me before hugging “you’re not a weirdo are you?”… I couldn’t honestly reply saying no, I mean I’m giving out free hugs for pete’s sake. I think it’s fair to say this challenge is something way outside of my comfort zone. I can’t say that I’ve ever gone around hugging strangers. I can think of countless times I barely even look at other people on tubes or hardly said hello as I walked past someone I know. I’m not a particularly loving person at the best of times, so this was definitely a good challenge. What I can say, is each hug that I gave did make me smile. Watching people’s reaction was very funny, and from what I could tell, I seemed to make a few other people smile… Whether it was from the hug, or just laughing at the strange man giving out free hugs. A smile is a smile, I’ll claim them all. Hopefully my random act of kindness made a few people’s day, theirs certainly made mine. Next > Week 8: Bingo!